I love my puppy. He’s so cute. Sir Grrr: The puppy formerly known as Wicked Prince Charming (which is what’s on all his papers, but not what I’m currently calling him), gets far too much attention. In a few more days, he will probably simply be “Grrr” like Invader Zim’s dog, (only much smarter of course). Here’s Sir Grrr in the first basket I used, it’s about the size of a shoe box. He was happy there for a couple days, until he learned to climb out. Then he was even more happy, but I was less happy — so we had to go to a larger basket to contain him. When he does ANYTHING it’s cute. Barking is cute, growling is adorable — I mean REALLY adorable and possibly on the same deliciousness level as baby laughter. I’m not saying he’s spoiled and I’m really trying not to create a pint-sized monster, but it’s taking concerted effort. He has the cutest little bare belly. It’s so round and just begs to be rubbed. I do overwhelm him with attention, but I don’t pick him up when he whines. I don’t reward the barking or growling (I just giggle to myself — preferably in an adjacent room). He mostly growls at leaves he’s managed to “capture” and fling side to side with his tiny mouth when going outside to presumably “do” business. Or at his little pink and purple poodle doll. He really gives her a good shaking from time to time. I started yesterday leaving him alone in a room for an hour. Today, I’m going to bump that up to two one-hour stints in his laundry basket. 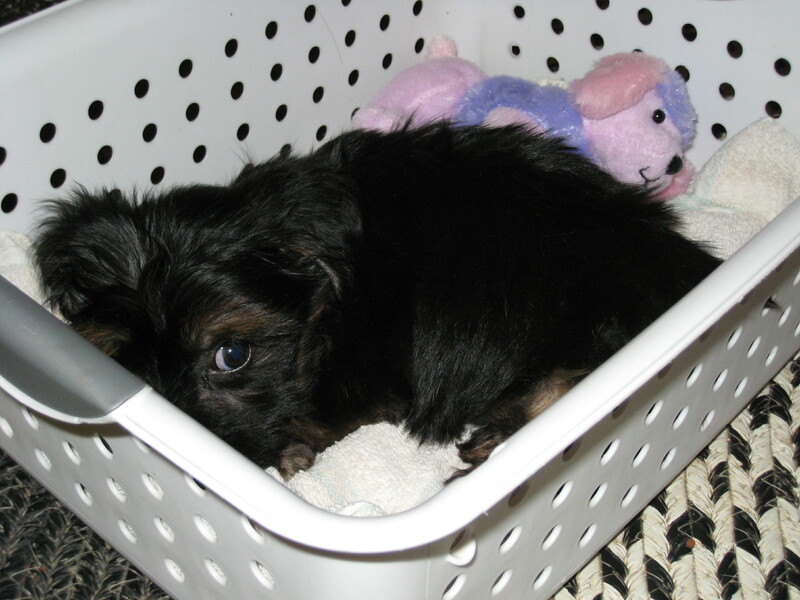 I may have to put him in a kennel if he gets bigger, but for now my purple laundry basket does a fine job of containing him and his tiny stuffed dog — with lots of extra room left over. and he has warned me sternly about treating the new baby… er, puppy… like a human. I dunno what would give him the idea that I might. Hmmmm. After the last many months, I must admit that having a cute, soft, cuddly little guy to crave and accept attention is rather nice. Maybe the little guy IS just what the doctor ordered for me. Right now, I’m loving having the time off work to get settled into the house by the lake again. I like the chance to get my head straight before beginning a new year. I like the “downtime” and wonder why I’ve not taken it before now. 2008 is going to be great. I’m not saying it won’t have its own challenges and hurdles… but after 2007 it doesn’t worry me at all. The economy is a concern, the housing market is daunting, I have a child that may be leaving home this year, and I still have a cabin to complete on the farm. I have many other adjustments to make… but it is still going to be far better than the last year has been. I will be. For now, I’m going to go pick up the puppy and sit with him in my lap while I enjoy a sci-fi movie marathon. Right now, right here, in the middle of the week! Now THAT is luxury!